How about that Hon Hai!?! The full name is Hon Hai Precision Industry Co., but you probably know it as Foxconn, the main name it does business under. It's the Taiwan-based contract manufacturer with hundreds of thousands of employees in mainland China, several of whom probably put your iPhone together. Foxconn is really big, and it's about to get bigger after completing the acquisition Friday of once-great Japanese electronics maker Sharp. You know the story about Amazon.com: It started out as a bookstore, and a big part of its revenue still comes from the low-margin retailing of low-tech products. In fact, according to the Global Industry Classification Standard taxonomy, it's really a consumer discretionary company, with peers such as Macy's and McDonald's. But Amazon has been investing more money in research and development than all but one or two other companies on earth -- which is why I've included it here among the world's tech giants, and also another big reason its margins are so low. Foxconn doesn't sell books, and its $1.6 billion in R&D spending last year was about 11 percent of Amazon's total (and also much lower than the R&D spending of the other three companies listed above). It just so happens that contract manufacturing of electronics is a really low-margin business. Foxconn's profit margin is 3.1 percent; at the No. 2 contract manufacturer, California-based Flex (formerly Flextronics) it's 2 percent. Foxconn's acquisition of Sharp is an attempt to boost those margins. The most expensive part of a smartphone is the display, and Sharp makes displays. In another attempt at raising margins, Foxconn has been replacing lots of workers with machines (its employee count went from 1.1 million at the end of 2014 to 830,174 at the end of last year). Still, it's fair to say that investors around the world aren't expecting a whole lot from these efforts. Part of the difference in market caps may be the result of overvalued U.S. equity markets. Part of it may be that U.S. corporate executives care more about keeping investors happy than Asian ones do. 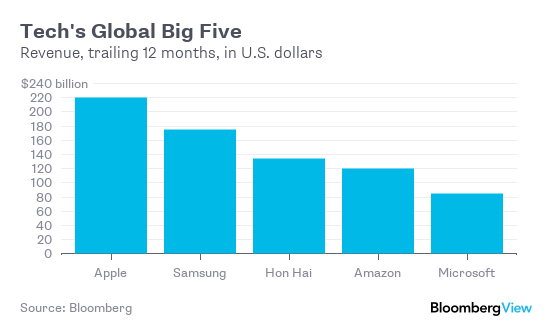 But the main divide I see here is that Samsung and Hon Hai manufacture things, while Apple, Amazon and Microsoft don't. 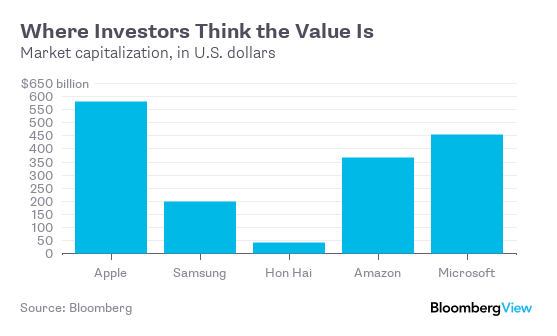 Samsung sells many of those things to consumers under its own brand, which is one of the reasons it is so much more valuable than Hon Hai. But while Apple, Amazon and Microsoft all sell products with their brand names on them, they contract out all the manufacturing. This isn't just an American thing. Chinese companies do it, too. Huawei, one of the world's biggest sellers of communications equipment, contracts out almost all of its manufacturing. 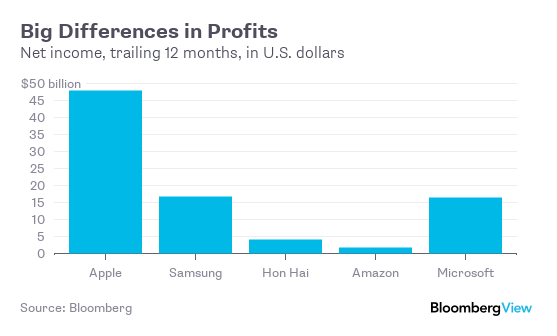 Smartphone sensation-turned-disappointment Xiaomi relies on Foxconn and other contract companies to make its products. Lenovo, which bought IBM's personal computer business in 2005 and long made a point of bucking the trend to outsourcing, has been putting more and more of its manufacturing in the hands of Flex. In 2009, Harvard Business School professors Gary Pisano and Willy Shih argued in the pages of the Harvard Business Review that technology companies that outsourced production were making a big mistake, and that the U.S. was being permanently harmed as high-tech manufacturing know-how moved to Asia. They may still turn out to be right about the geographical impact -- the southern Chinese city of Shenzhen, home to Foxconn's biggest manufacturing facility as well as the headquarters of Huawei, Chinese internet giant Tencent and scores of other tech companies, certainly has prospered from the shift. But for individual tech companies, getting out (or staying out) of the low-margin, high-investment business of manufacturing just keeps paying off.